For some background on this subject or to see this kit as it appears straight out of the box, look here. Shortly after my review of this kit, Fotios Rouch and I were comparing notes as he had pre-ordered this kit from Lucky Model and had some concerns. He also mentioned that there were some online builds having some challenges with this kit, so I decided to avoid reading other folks' problems and tackle the kit in a quick-build. First up is the cockpit. 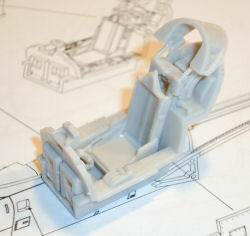 The ejection seat rails and canopy lift subassembly drop into scribed slots in the rear bulkhead of the cockpit tub. This makes what might have been an awkward subassembly go together quickly. The details on the side consoles and instrument panel are a little on the soft side. I'm sure we'll be seeing color photo-etched panel and side consoles in our future, so this isn't a problem, but the AMS modeler could use some careful painting and a set of Airscale Instruments decals to make this stock kit really look nice. 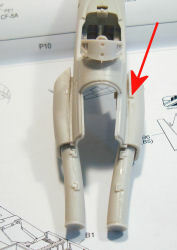 Kinetic uses panel inserts to provide the different details for the F-5A versus the CF-5A and the inserts that go into the forward fuselage halves just behind the cockpit are not thick enough for the molded in recess. These parts go into the recess a few mm and look rather awkward. 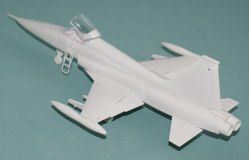 The simplest solution was to cement strips of Evergreen styrene to the backs of the inserts and glue the panels in place. My panels now sit flush with the rest of the fuselage surface. Next up are the intake ducts. Here was the next little mystery - the duct halves didn't align properly. When I swapped duct halves, they fit beautifully. Instead of pairing D6-D5 and D1-D9 as shown in the instructions, I used D6-D1 and D9-D5 and everything lines up. Note that one of my halves had an ejector pin mark on the inside and I used a round file to remove that problem. Since I had lost track of which duct was which, I discovered that both ducts will fit on either side of the forward fuselage. One will cant downward when the cockpit is upright, the other will can upward into the fuselage. We want the upward cant on both. 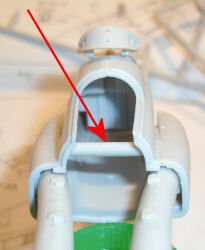 The upper boundary air fairing doesn't fit properly with the upper side of the splitter plate (on both sides). This was quickly remedied by filing back the fairing a little at a time until the intake splitter plate dropped into place. 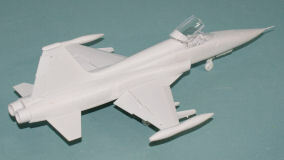 The upper wing halves mate to the lower wing half nicely. I ran a bead of liquid cement into the flap tracks and clamped the assembly together. The arrow in the image above points to my impatience. When I was trimming that upper boundary layer fairing to make room for the splitter plate, I filed off a little too much. This would be easily fixed with a dab of filler. 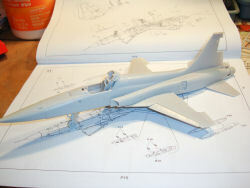 The rear fuselage goes together without much effort and the wing section drops into place. Note that the wings center on the narrowest part of the fuselage - the first time you mate these two parts together, you may not see the alignment steps in the mating surfaces right away. 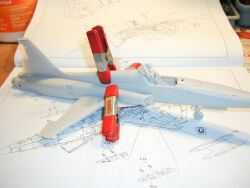 With the wing section in place the ventral fuselage plate drops into place and you'll know if you're aligned properly when you see the stabilator mounting hole appear round. The first real fit problem comes when you mate the forward and rear fuselage halves as the forward fuselage is set up to dovetail into the rear, but the upper rear portion of my forward fuselage bowed inward and wouldn't mate up with the rear fuselage. I took a page out of Fotios' techniques and simply inserted a section of a sprue tree between the rear portion sections that needed to be spread wider and glued the section into place. 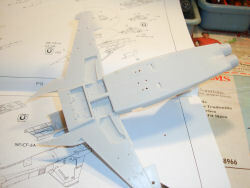 With the spreader section in place, the forward and rear fuselage subassemblies go together with cement and three clamps to help align everything. Here is what the basic airframe looks like assembled. The next step will be to add the rest of the small details and see what happens. I installed the main landing gear per the instructions and I'm impressed with how the main gear retraction arms are installed in the main wheel wells to provide excellent support and alignment for the main landing gear struts. 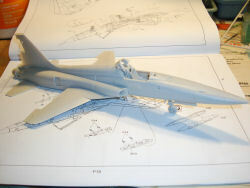 With the model on its gear, the main wheels and gear doors go on next. Once again there is some nice engineering here to make the installation of these parts painless without adding shapes that don't belong there. 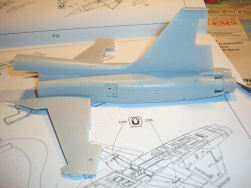 Forward/rear fuselage joint - it may be that my kit came out of the molds too soon and the panels on the rear of the forward fuselage bowed inward, but in any case, the steps described above solved that problem. 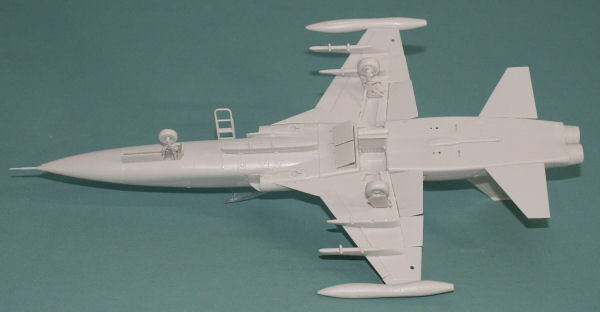 The outboard weapons pylons - these pylons should have the slant downward from the undersurface of the wing to allow clearance for the leading edge flaps. 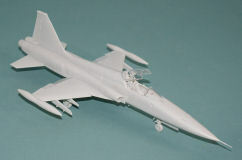 The kit parts start downward at the leading edge of the wing so the flaps can't deploy. Checking some reference photos show that this will be an easy fix with some sprue cutters and a file to shift the leading edges of the pylons aft. Tip tanks - it may have been an innocent attempt to avoid the extra tooling for the starboard wing tank by molding two port tanks, but it doesn't work. The port tank has a nicely shaped recess molded into the side for the port wingtip to slip inside complete with flat bottom and curved upper surface wing shape molded into the tank. Likewise the circular access panels atop the tank are molded in the correct location. The problem comes when you mount the second tank on the starboard side. It doesn't fit unless you get an X-Acto knife and alter the shape of the wing recess to accept the starboard wingtip shape. It didn't take much effort to make that modification as you can see in these photos, but the tank is up-side-down. I didn't install every antenna, light lens, or air scoop on the kit, but you can see that there are no glaring problems with this model and there is no filler used on this kit (as I mentioned above). 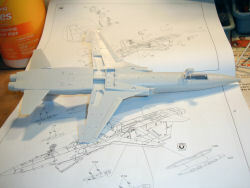 The kit goes together very nicely and I plan on building several more after this experience. The three problems described above are very minor and easily overcome with a little modeling skill. 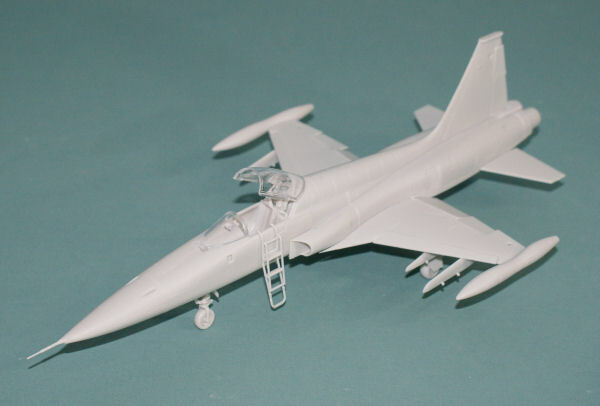 Kinetic Models has done a very nice job with this kit and I can re-emphasize my original conclusion from my in-box review of this kit: Definitely Recommended! Thank you Kinetic and I hope we'll be seeing the F-5B and perhaps the F-5C in our future.